A completely new edition of the popular guide, illustrated with a map and contemporary photographs, which takes the walker, or the armchair reader, around John Muir’s Victorian Dunbar. 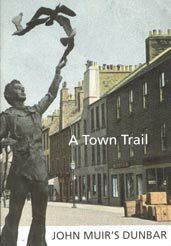 With origins in the mid 1990s Millennium Commission bid by Dunbar’s John Muir Association the Town Trail is now in its third edition. The text dives into the Dunbar of the 1840s and follows in the footsteps of the young John Muir at home, at school, and at play. Wall markers at key sites link to the text, which in turn provides clear directions throughout. John Muir’s Dunbar was extensively revised and rewritten to include new findings and republished in 2008.